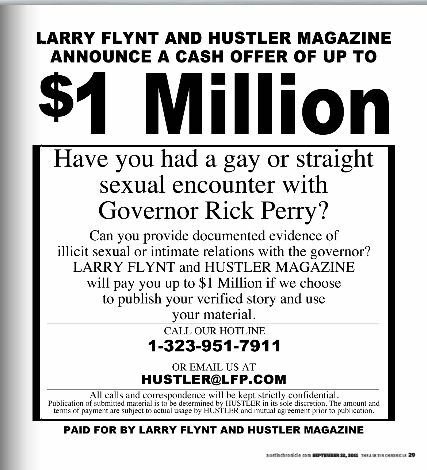 Larry Flynt has purchased a full-page ad in a Texas newspaper offering $1 million to a person who has "had a gay or straight sexual encounter with Governor Rick Perry" -- and can prove it with evidence. "Can you provide documented evidence of illicit sexual or intimate relations with the governor? LARRY FLYNT and HUSTLER MAGAZINE will pay you up to $1 million if we choose to publish your verified story and use your material," reads the ad, published in the new edition of the Austin Chronicle alt weekly. There are long-standing -- but completely unsubstantiated -- rumors that Perry, who is married, has had affairs. In taking out the Chronicle ad, Flynt follows in the footsteps of an Austin Ron Paul supporter who took out a similar ad last month. Flynt, of course, has a long history of offering money for proof of sexual hypocrisy by conservative leaders. I've reached out to both the Perry camp and Flynt for comment, and will update this post if I hear back.